When you find yourself wanting to get your point across to others, take time to tell them a story. Any time you have the opportunity to share personal stories and areas where you have beat the odds are great to share. I found myself sharing more and more lately and it has made a tremendous difference in my ability to get new clients and gain more opportunities to speak. If you want to increase your customer base, clients or sell yourself more, share stories that show the REAL you. I have shared more than I wanted to sometimes, but when it feels right keep going, most people will not remember anyway. So to transform your selling goal remember EVERYBODY SELLS EVERY DAY. 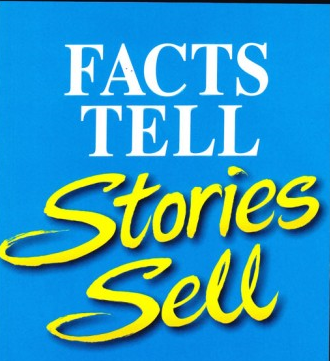 Facts Tell Stories Sell!